There are some types of dirt that make garden hoses look bad. In these situations, you need a power washer to blast away stubborn grime. Here, we look at Sun joe vs Greenworks vs AR blue vs Karcher Pressure Washers to help figure out which one among these top brands takes the lead. Below is the comparison of top selling model of each brand i.e. 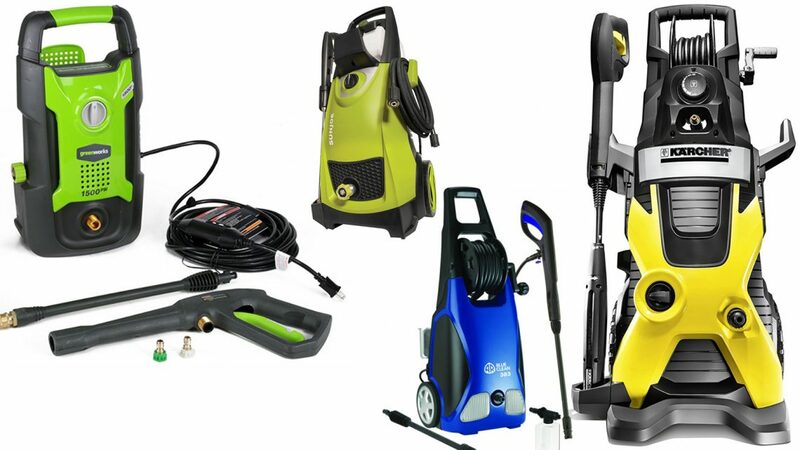 SPX300 from Sun Joe, GPW1501 from Greenworks, K5 from Karcher and AR383 from AR Blue Clean. So here it goes. Below is the full comparison between these pressure washers. This includes their specification, features, accessories, warranty, price and the user feedback. So let’s start digging the specs & features starting from Sun Joe. Here are some examples of pressure washers that have made an impact in the market. We take a look at their specs as listed in order of practicality and usefulness. Sun Joe identified the SPX 3000 Pressure Washer as its top-selling product. It is powered by an 1800-watt motor to generate streams of up to 2030 PSI and 1.76 GPM water flow. These features ensure that the force it produces is enough to remove even grease and tar. The Sun Joe SPX 3000 features a dual detergent tank system, so you can use two different types of soap at the same time. The tanks are removable and have a capacity of 0.9 L. There is a detergent selection dial to easily switch between the tanks. It can be a convenient feature for surfaces that require either a lot of soap or different cleaning techniques because you won’t have to keep on switching the detergent tanks. As for the spray wand, the Sun Joe SPX 3000 has a 34-inch extension wand to ensure that even the hardest to reach areas can be washed. Another convenient feature is Sun Joe has five Quick-Connect spray nozzles. These nozzles can be switched from low pressure to high pressure, depending on the kind use. The nozzles, as listed in order from strongest pressure to least, come in 0, 15, 25, 40 degrees. It also has a detergent nozzle. The Sun Joe SPX 3000 has high mobility due to its reversible wheels and 35-foot power cord. It also comes with a 20-foot high-pressure hose for an even longer reach. As a safety feature, it has a Total Stop System that shuts down the pump when the pressure washer’s trigger is not activated. The effect is a longer lifespan for the Sun Joe SPX 3000. Karcher is a German brand known for its cleaning equipment, such as vacuum cleaners, hard floor cleaners, and power washers. 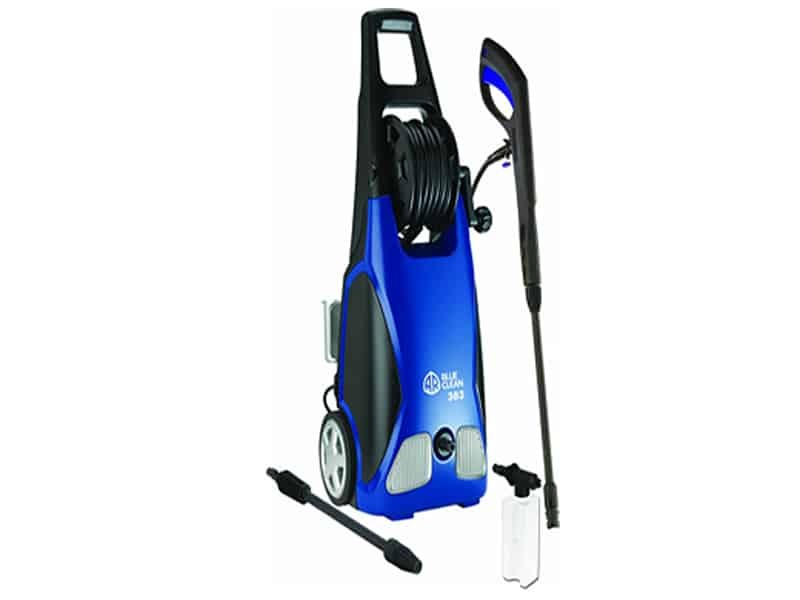 It is a worldwide operation that also produces professional cleaning equipment. The Karcher K5 Premium Electric Power Washer represents its top-of-the-line offering among electric pressure washers. Its power comes from its ability to produce blasts with 2000-PSI pressure and 1.4 GPM flow rate. It can reach that pressure using a 120 V-volt power supply. As for its dimensions, the Karcher K5 Premium Electric Power Washer measures a manageable 16.46 x 16.77 x 34.33. Its weight without accessories is 28.7 lbs. There are several key features to this product. The first is the water-cooled induction motor. The device lowers the operating temperature by circulating water around its motor. Incidentally, the Karcher can also tolerate up to 104 F water temperature. The effect of the water circulation is that the motor life is extended to up to five times the usual lifespan. The Karcher K5 Premium Electric Power Washer is also a quiet worker because of its motor, especially when compared to commercially available gas pressure washers. Another distinct feature of the Karcher is its onboard detergent tank so that detergent can be conveniently used while washing. The tank is removable so that it can easily be refilled or cleaned. This detergent tank can be adjusted depending on how much detergent is needed. Simply turn the detergent flow dial to the desired setting and avoid wastage. Karcher K5 is the best selling model in the electric category of Karcher Pressure Washer brand. 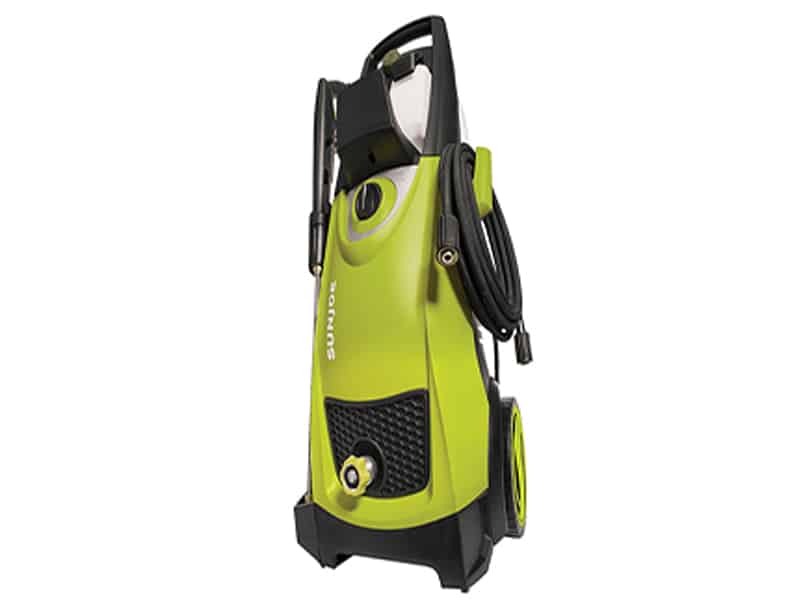 The Karcher K5 Premium Electric Power Washer also has a pressurized hose reel built into its body. It can be used with a 25-foot hose. As a result, it is much more convenient to use and store the hose while washing. 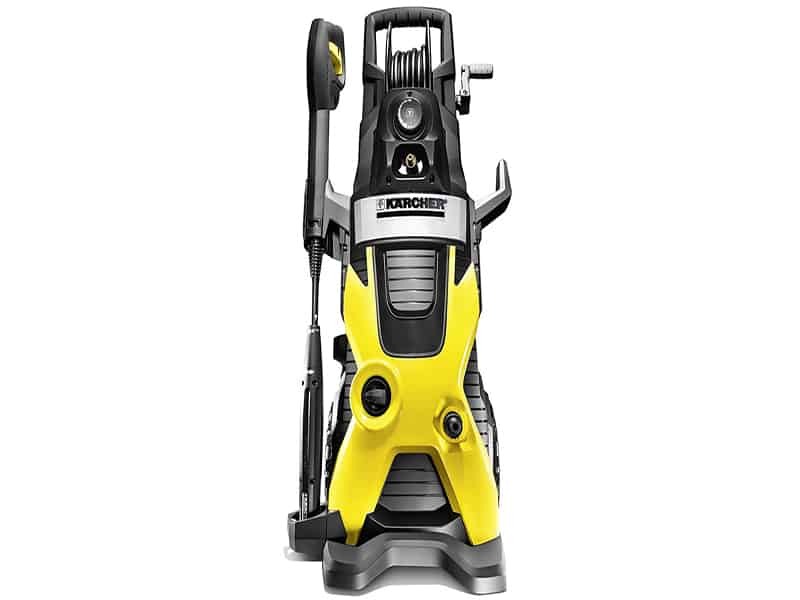 Finally, the Karcher K5 Premium Electric Power Washer has two different wands included with the device. The first is the Dirt Blaster Wand, which increases the pressure stream of the device even further. For usual use, the Vario Power Spray Wand can be used. It has a switch that can allow you to adjust the pressure as you are using the device. When the setting is at the low, the Karcher K5 automatically releases detergent. The AR Blue Clean AR383 is just one of the products from the consumer line by a specialized company named Annovi Reverberi. This Italian company has 58 years of experience focusing on the production of pumps. The AR Blue Clean AR383 is powered by a 13-amp universal motor to produce up to 1900 PSI of water pressure and 1.5 GPM water flow. The motor gets its power through a 35-foot power cord with an Auto-Reset GFCI module. The water is controlled using a spray gun with AR Blue Clean’s Quick Release Bayonet fittings. This feature makes it easy for the pressure hose and wants to be removed or installed. The hose measures 20-feet and comes with a hose reel for easy storage. The reel also makes the hose easier to manage when using the pressure washer. Simply roll out the suitable length to prevent kinks from developing and obstructing the water flow. As for the detergent, the AR Blue Clean AR383 has a 14-oz detergent bottle. Finally, it makes use of the Total Stop System, which automatically turns off the device when the trigger is not activated so that pump life is extended. Greenworks Tools specializes in battery-powered outdoor devices. But, it also has products that are non-battery operated. One such example is the Greenworks GPW 1501 Pressure Washer. It can stream water at 1500 PSI with a water from of 1.2 GPM. The features of the Greenworks GPW 1501 are straightforward. It has an onboard tool storage with quick connect nozzles. There are two spray patterns: 25 and 40 degrees. As for mobility, the Greenworks GPW 1501 has a hose length of 20 feet and a cord length of 35 feet. When it comes to features, it is hard to top the Sun Joe SPX 3000 because it is able to produce the highest level of pressure among the products listed. It can reach up to 2030 PSI and 1.76 GPM water flow. Comparing this to the lowest powered pressure washer, the Greenworks Pressure Washer can only produce 1500 PSI and a water flow of 1.2 GPM. The Sun Joe SPX 3000 also earns points for its dual detergent tank. Compared to the other products, it can provide a better cleaning experience because it can easily switch from one tank to the other. However, the Karcher K5 Electric Pressure washer edges out the competition when it comes to the lifespan of the device. It claims to be able to extend the life of its motor by up to five times because of its water-cooling feature. 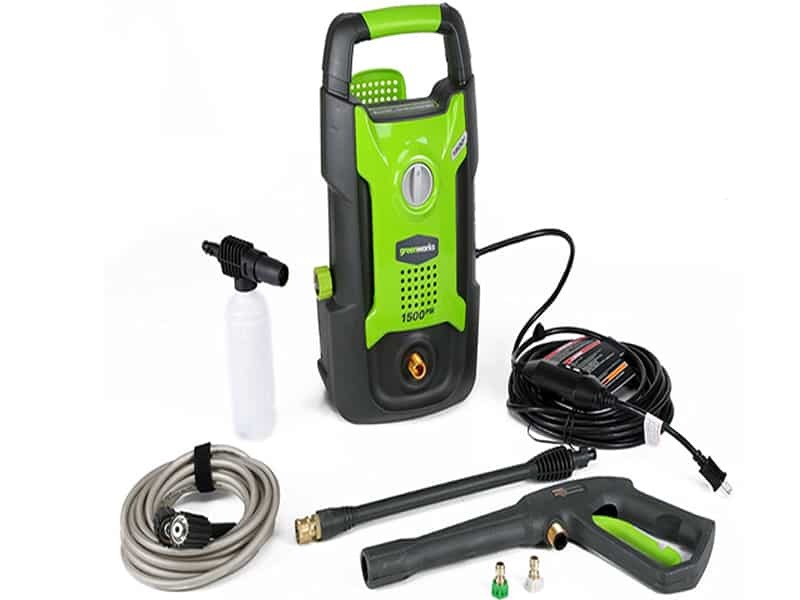 Greenworks has several accessories and parts separately available for its pressure washers. An example is the five-pack nozzle tips. As for the accessories included in the pressure washer when purchased, it only comes with the basic features of tool storage and basic nozzles. The Sun Joe comes with easily-connected pressure wash nozzles and a wand. As for the Karcher, it comes with the most number of accessories among the listed products for review. It has the Vario Wand and the Dirtblaster Wand. Additional accessories can be purchased separately, such as the extension hose, foam nozzle, and four-piece extension wand. The AR Blue provides the basic accessories, such as two high-pressure wands: the Adjustable Spray Wand and the Turbo Wand. It also has a 14-ounce detergent bottle. The Karcher K5 Electric Pressure Washer falls at the top of these products when it comes to price. Its listed price is at $329.99. At the lowest end is the AR Blue Clean, which hovers at around $90. The Sun Joe SPX 3000 is at $199.99 while the Greenworks 1500 is priced at $99. Greenworks offers one year of warranty for pressure washers. The warranty period is covered from the date of shipping. Greenworks can opt to replace, repair, or refund a pressure washer that has been damaged during shipping. The warranty covers all defects that stem from normal use. It is the obligation of the user to replace part or the entire product if the device is subjected to the usual normal wear and tear from use. When returning the device still covered by the warranty, Greenworks requires that you call and get a Return Authorization form. You can also receive a refund of the original shipping fees paid out. Replacement products will be shipped on the account of Greenworks. Similar to Greenworks, AR Blue offers a limited warranty on its product for up to one year from the date of purchase. The warranty is non-transferable and only applies to the original buyer of the product. Also, the warranty only applies to consumer use and not to rental or commercial purposes. The warranty covers against defects in the materials and workmanship. To return a defective product, the user should have a Returned Merchandise Authorization Number and provide proof of purchase. Failure to do so will result in having the product returned to the sender. In cases like these, AR Blue will not shoulder the cost of shipping for its return. Please double check your product warranty before purchasing on the product page. Karcher also offers a one-year warranty on its product. The warranty covers defects from the materials or craftsmanship of the product, exclusive of any wear and tear that occurs from normal use. Karcher offers a Rapid Exchange Program. Defective products must first be evaluated by customer support or through an authorized service center. Karcher will either replace or repair the product at no cost to the user. Sun Joe offers double the warranty period for Greenworks, Karcher, and AR Blue. Its warranty period is at two years for those in the United States and Canada. The warranty covers against defects in materials and workmanship. This warranty only applies to residential use. If the product is used commercially, such as through rental, the warranty only lasts for 90 days from the date of purchase. Sun Joe can either replace, repair, or refund defective products at no expense to the user. To avail of this feature, the product needs to be returned to Sun Joe in its entirety. The Karcher K5 Premium Electric Pressure Washer has moderate reviews. Most of its users are satisfied with the product. However, the product does not distinguish itself from other similar devices at lower prices. One of the key points raised about the Karcher K5 Premium Electric Water is that it runs quietly. The Sun Joe SPX 3000 had slightly better reviews compared to the Karcher pressure washer. The device can deliver its promise of a high-pressure washing experience. Although there have been reports that the shipped products were defective, customer service works, and replacements can be made easily. As for the AR383, the reviews on the product are average. There are some reports of leaks, especially on the hose. There are also some concerns that the materials used to make the product are not as durable. However, the AR Blue Clean AR383 can be a good purchase for basic needs. Most consumers indicated that the device is easy to assemble and works well. Greenworks had the highest average reviews among the products listed in this review. Customers agree that it delivers when it comes to performance, especially considering its price point. In the battle of Sun Joe vs Greenworks vs AR blue vs Karcher Pressure, it seems that the Greenworks GPW 1501 delivers when it comes to the basic performance of pressure washers. If you are in the market for a basic pressure washer, it is a reliable, bang-for-your-buck purchase. For those looking for more bells and whistles in their pressure washer, the Sun Joe SPX 3000 Pressure Joe 2030 Electric Pressure Washer can be a good option. It has a slightly higher price point but has convenient features like the dual detergent tank. All the products reviewed offer good customer service, according to the reviews left by past consumers.